The enlargement of lower part of aorta in the abdomen is termed as Abdominal aortic aneurysm. Should there be a rupture in the abdominal aortic, aneurysm may cause abnormal bleeding. This leads to internal bleeding which is otherwise known as haemorrhaging. The treatment for such a case is dependent on the location of the haemorrhaging as well as the size of the enlargement. The condition normally takes place in individuals over 60 years of aged. Smoking, high cholesterol, high blood pressure are just come of the factors that lead to abdominal aortic aneurysm. Although abdominal aortic aneurysm takes place in individuals over the age of 60, there are cases taking place in individuals in the age range of 40 – 50 as well although very few. This number will tend to increase in the coming years if individuals do not make any changes to their lifestyle. The current lifestyle of people is one of the main reasons as to why abdominal aortic aneurysm takes place. In terms of incidence, North America has the highest percentage of abdominal aortic aneurysm and is expected to remain the highest contributor till the end of the forecast period. There is however investment in R&D across the globe for the development of drugs for abdominal aortic aneurysm which will add to the growth of the market during the forecast period. The Abdominal Aortic Aneurysm market can be segmented based on type of treatment Surgery, Open surgery, Endovascular aneurysm, Medication, Antihypertensive, Antilipidemics. 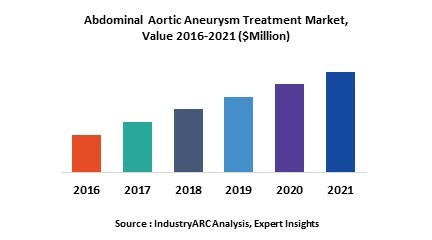 The Abdominal Aortic Aneurysm market has been segmented based on the location of where the treatments can take place, Hospitals and Clinics. The market has been segmented based on the following geographies. North America, South America, APAC, Europe, Middle East and Africa.